Scottish Government ministers have agreed that railways should at least be competitive with roads. This is surely a pre-requisite for Government policy to limit carbon emissions by making transport less polluting and sustainable for the future. Sadly, it does not seem to be happening yet for the Highland Main Line against the backdrop of the £3bn of investment going in to the A9, the other main player in this busy and strategic transport corridor between the central belt and the Highlands. Inverness at one end is rightly recognised as the Hub of the Highlands connecting by rail and road with three more corridors to the north, east and west. The regular July and August overloading of passenger trains on the HML seems to have been worse than ever this year. Part of the reason will have been the increase in tourist numbers. Tourism is one of Scotland's biggest industries. The Inverness area is Scotland's second most visited area after Edinburgh. The many stories of overcrowded trains are damaging the Scottish economy, inconveniencing many people and no doubt deterring some from using the railway again. Hopefully, it will be a lot better next year with the planned increases of train capacity and service frequency which should be introduced by May 2019. Dualling of the A9 is apparent to all, with new sections opened and frequent press releases and consultative meetings. A lot of work has gone on in the past five years. During this time planning for promised extra line capacity on the railway has been painfully slow with just two operational improvements at Aviemore and Pitlochry now under construction and the Scottish Government short-sightedly congratulating itself on spending less money than was allocated for CP5!! There is no sign of the suggested loop reinstatements at Ballinluig, Etteridge (near Newtonmore) and Murthly, nor of any dualling of parts of the line. [I am advised that continuing the double track section northwards from Dalwhinnie for two miles might be cheaper than rebuilding the Etteridge loop. Either would minimise delays on this 13-mile-long uphill single track section bottleneck]. Freight operators are wanting loops made longer, including at Ballinluig, so that they can operate 40% more efficiently with 28 containers on a train rather than the existing limit of 20. Much whisky related traffic to and from Speyside goes by road along the A9 to Aviemore and then on the very narrow A95 towards Keith. HITRANS funded trials which showed that much could go by rail given suitable investment in track and terminals. This has not happened and, instead, lorry speed limits have been increased on the A9 part of the journey. How is the railway expected to achieve the government target of 7.5% more new business for railfreight? Abellio ScotRail's response to the HML overcrowding is to reduce the number of cheaper Advance tickets on sale. That is not unreasonable in the circumstances but those who are not put off from travelling on the train will pay full fare with no guarantee of a seat, sometimes standing for much of the journey with the refreshment trolley also stuck in one doorway and unable to serve the majority of passengers. Meanwhile there is an all too easy option for Scottish residents who are aged over 60. Go by bus for free and maybe even get your refreshments paid for by the taxpayer! Increase the congestion on the approaches to the cities in particular and add to the emissions and potholes from more and more road vehicles! Trains cannot compete with this free road travel on price. I have heard of charity board members travelling by bus all the way from Inverness to their meetings in Edinburgh. There is a train at exactly the same time but, because they are in their sixties, they commendably travel by bus to save the charity money when paying expenses. An earlier ScotRail change of policy here has not helped. Their cheaper Advance tickets are no longer available on the early trains from Inverness because the rule has been changed back to prohibit use on trains leaving before 09.15am. The first cheaper train to Edinburgh is now the 09.41 "tortoise" train from Inverness which takes 3 hours 43 minutes and arrives at 13.24. A very far cry from the 2 hours 45 minutes headline journey time promise of 2008! The reason for the restriction is to avoid overcrowding on morning peak services into the cities. FoFNL succeeded in getting this restriction changed to "Trains arriving in Edinburgh and Glasgow before 09.30" some years ago. This was much more competitive for the HML market and still sorted out the city problem. Sadly, ScotRail in Glasgow changed it all back again a few years ago thus making the HML less competitive once again. The remedy is in their hands! The refurbished ScotRail Inter-City trains will completely eclipse buses for comfort. Train travel is far less stressful than driving and also gives the option of getting some work done at the same time or just enjoying the scenery which is a tremendous asset on the HML. There is plenty of scope to market the train if a better fares structure can be devised. We must get a grip on sorting out this line with its increasing demand for passenger and freight services. Both the Highland and the Scottish economies are being damaged by the delay. The really helpful Far North Line Review Team has now been replicated for several other lines. In the past I have called for a 'Czar' to animate action on the HML. So far, I have resisted jumping on the Review Team band wagon for fear of the deleterious effects of further workload on the rail teams at Transport Scotland and Network Rail. I now believe the time has come to move the planning and implementing the many possible HML line capacity improvements up to top gear without delay. In a Transport Scotland press release on 17 August concerning the A96, the Transport Minister is quoted as "relishing" the "huge task" of dualling the road. Please may we have a Scottish Government team which will relish making the HML the strategic railway that Scotland needs? The impressive Airdrie to Bathgate line would be the kind of standard to aim for initially. Thereafter another 30 minutes could be saved by continuing Perth and Inverness services to Edinburgh by the direct Kinross-shire corridor route which was closed in 1970 to make way for the M90. Rail passengers would relish that! 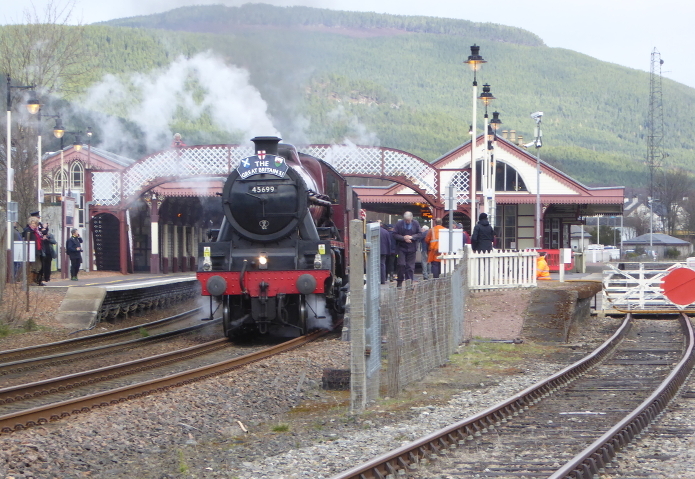 LMS Jubilee 45699 Galatea leaving Aviemore with the Great Britain tour on 23 April 2018. Will there still be paths for this train next year when the more intensive HML timetable comes in?